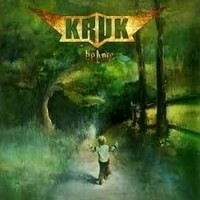 KRUK is a Hard Rock band from Dąbrowa Górnicza in Poland formed in 2001.Band has released albums: „Memories” (with Grzegorz Kupczyk) in 2006, „Before He'll Kill You” in 2009, „It will not come back” in 2011, „Be3” in 2012 and in February 2014 was released reissue of album „Before He'll Kill You”. Now the band comes back on stage with new album „Before” recorder with new vocalist Roman Kańtoch. The opening track “My Sinners” shows true Hard Rock sounds with flavour of awesome Hammond keys and stronger riffs in climate of BLACK SABBATH and DIO. Lower riffs, gentle keys, and a mind piercing voice is gentle and also powerful! What an impressive guitar solo. This is epic song lasts almost 10 minutes, where are also some moment of SABATON's riffs & a perfect Hammond solo! Very energetic track “Last Second” has incredible Hammond keys inside which give this song many melodies and the guitar solo is truely melodic Hard Rock in the 80’s style. “Morning Star” is a potential hit with mega melodic guitars, Hammond in the background, wonderful solo, catchy refrain, and nice vocals. I love the energetic track, “Grey Leaf” with catchy chorus, guitars with commercial echoes, choir singing together and many positive sounds. Also worth to listen are: “Wings Of Dreams” with calmer Bluesy and Country echoes, gentle piano & memorable refrain, a powerful track with DEEP PURPLE style Hammond in “Open Road”, beautiful ballad “Farewell” with calm guitar and wonderful vocal, and another brilliant ballad, almost 8 minutes long, “Once” with gentle vocals, nice calmer guitars, and female vocals too. “Moja Dusza” and “Szary Liść” are two bonus tracks – they are tracks “Farewell” and “Grey Leaf” but with Polish lyrics. Production of album is on high level and you can hear the experience of the musicians. The music of this Polish band is so melodic & energetic. The guys’ compositions are so catchy and enjoyable during listening. KRUK is always for me Polish Gods in Hard Rock of the 80’s. Everyone who loves Hard Rock and such bands as DEEP PURPLE, URIAH HEEP, DIO, BLACK SABBATH and LED ZEPPELIN surely will love sounds of these Polish Rockers too.